Things Remembered Personalized Athena Pavé Champagne Flute Set with Engraving Included by Things Remembered at Marion Street Deli & Pub. MPN: 345626. Hurry! Limited time offer. Offer valid only while supplies last. These Things Remembered Personalized Athena Pavé Wedding Flutes bring a trendy yet traditional laurel leaf accent to the wedding reception. These Things Remembered Personalized Athena Pavé Wedding Flutes bring a trendy yet traditional laurel leaf accent to the wedding reception. Personalize the front and back with your names, wedding date and a line from your vows at no additional cost. Size: 11" x 2.5" Capacity: Holds 5.74 OZ. SUPERIOR QUALITY AND DESIGN - The Athena Pavé Champagne Flutes are a new twist on a classic idea: the bottom of the glass is wrapped in pavé jeweled laurel leaves. Each 11-inch high flute holds 5.74 oz. in a classy and contemporary manner. KEY DETAILS - These gorgeous flutes, with intricate pavé jeweled details around the base and the bottom of the glass, will add a touch of class and elegance to the celebration and provide a lovely way to remember the occasion. 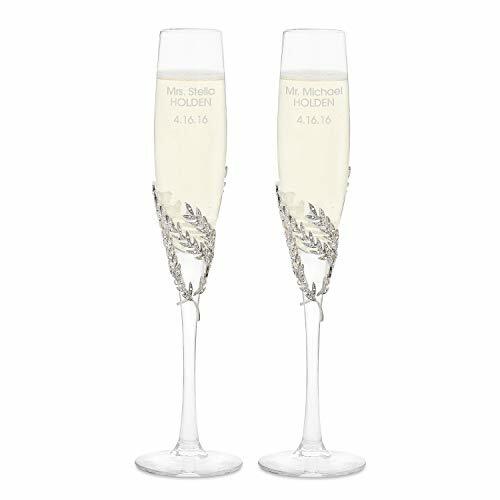 GIFTING INSPIRATION - These gorgeous personalized champagne flutes, with engraving at no additional cost, make a perfect gift for an engagement, wedding, bridal shower or anniversary.